10 days until the Barrie Colts Home Opener! (Tkaczuk, Hutchings and Blandisi) #OHL - Very Barrie Colts | A website covering the Barrie Colts of the OHL. 10 days until the start of the Barrie Colts 2017-18 regular season! 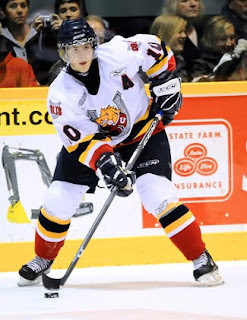 Daniel Tkaczuk, Alex Hutchings and Joseph Blandisi all wore 10 with the Barrie Colts. All three played huge roles on the Colts. Though, Blandisi came over after spending time in Owen Sound and Ottawa, he still put up some incredible numbers in Barrie. Combined, the three players played a total of 545 games with Barrie and totaled 311 goals, 356 assists for a combined total of 667 points. OHL Draft: 1st Overall at 1995 OHL Priority Selection Draft. NHL Draft: 6th Overall at 1997 NHL Draft by Calgary Flames. 105 OHL points in 1998/99 is 9th most over a season in Colts history. 45 goals in 1996/97 is 8th most over a season in Colts history. 43 goals in 1998/99 is 10th most over a season in Colts history. 62 assists in 1998/99 is 7th most over a season in Colts history. +57 in 1998/99 is the 3rd best plus minus over a season in Colts history. 334 points is the 2nd most all time in Colts history. 145 goals is the 2nd most all time in Colts history. 238 games is 9th most played in Barrie Colts history. He was the team captain for 3 seasons. Most years to serve as captain in Colts history. WJC U-20 Silver medal winner. OHL Draft: 36th Overall at 2006 OHL Priority Selection Draft. NHL Draft: 93rd Overall at 2009 NHL Draft by Tampa Bay Lightning. 47 goals in 20009/10 is 6th most over a season in Colts history. 11 game winning goals in 2009/10 is 1st most over a season in Colts history. 208 points is the 9th most all time in Colts history. 111 goals is the 6th most all time in Colts history. Alex is set to play with IF Björklöven this coming season. NHL Draft: 162 Overall at 2012 NHL Draft by Colorado Avalanche. All-Time Rankings among Colts Players:. 52 goals in 2014/15 is 2nd most over a season in Colts history. 60 assists in 2014/15 is 10th most over a season in Colts history. Served as team captain in 2014/15. 68 career NHL games with New Jersey. 8 goals and 18 assists. 2014/15 he was one of 3 Colts to reach 100 points in a season. Andrew Mangiapane and Kevin Labanc were the other two.